Issues & Action Conference: NC Women Matter! Approximately 80 women participated in a lively and timely conference on Saturday, July 20, 2013 in Greensboro, NC at the Global Learning Center of Bennett College. The conference was sponsored by NC Women Matter and included women from various organizations including the League of Women Voters, the NC Association of Educators, Business and Professional Women (BPW), AAUW, MomsRising, Democracy NC, and Delta Sigma Theta. 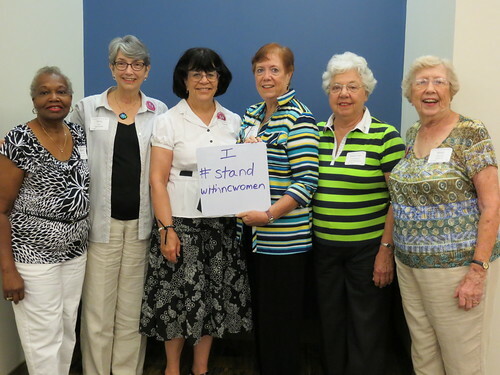 At least nineteen AAUW members attended, some as the primary representatives of other organizations. The purpose of the conference was to bring women together to discuss issues of importance and to prepare action plans. An update on key issues resulting from the recently concluded session of the General Assembly included Tazra Mitchell of the NC Justice Center on the state budget, Jina Dhillon of NC Women United on the National Health Law program and John Dornan, an Education and Management consultant, on the impact of legislative actions on the educational system in NC. There was almost no good news. Use Polling data if you have it. (Example—People in NC are proud of their school systems, so build on the pride—i.e. Don’t treat kids as cattle by eliminating class size restrictions vs a focus on teacher salary. Write a multi-layered message—start with a key phrase and build on it from a slogan to a sentence to a paragraph. Entertainment at lunch was a performance by the “Raging Grannies” who have been entertaining and motivating attendees at the Moral Monday rallies in Raleigh. After a morning spent listening to issues, the afternoon sessions focused on how to take action. Topics included building organizational coalitions, linking issues to the ballot box and how to get out the vote, including helping people without approved voter IDs to get them. The afternoon concluded with a motivational drumming performance that had all of the attendees involved.